I'm trying to make a habit of posting ancient shield blazons as I come across them. I hope the graphics will be of use to wargamers, reenactors, and illustrators. This Roman sculpture depicts a Gaulic shield with carnyx. I scanned this from Espérandieu's Recueil Général des Bas-Reliefs de la Gaule Romaine et Pré-Romaine. Vol I, page 297. 1908. This Roman relief of captured equipment was found in Nimes, France. 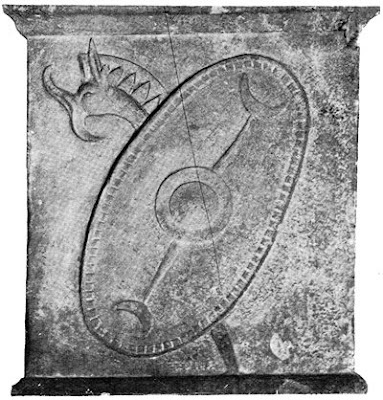 Note: crescent shapes also appear on the Gaullic shields on the Arc d'Orange. 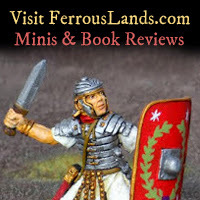 This is a treasure trove of information you've built up on the Roman world. I'll certainly be spending a lot of time on here researching background information for the Late Roman army that I'm collecting and painting. Thanks Peter. Most of the posts here are 50BC - 100 AD, but I have been planning an illustration of Dark Age shields (Arthurian, Saxon, Viking). I feel like I need to address the inaccurate descriptions of shields in Cornwell's novels!